Walnuts are theoretically self-fertile, with individual trees generally carrying both male and female reproductive organs. In practice the best solution to assure a good pollination is to mix varieties. Seedling trees grown adjacent to the plantation, up to 1 ½ miles away, may also be influential in the pollination of the main crop. In intensive plantings there is no need to have more than about 5% of the total number of trees given over to pollinators, but these types should be planted on upwind rows so that their pollen is spread evenly throughout the planting in the prevailing wind. The male is represented by the catkin which starts life as a tiny, inconspicuous cone-shaped stud. This feature forms in one season and is carried through the winter without developing its full potential. In the following late Spring, this stud starts to enlarge and lengthen, eventually hanging down 2-4 inches. Over a further two or three weeks the catkin ripens and opens out, and swaying gently in the breeze starts to distribute the pollen which drifts downwind. The pollen does not appear to be of great interest to bees, however casual encounters with insects may help to increase the effective spread of the pollen from one tree to another. The female flowers are carried on trees at about the same time as the pollen starts to be delivered. 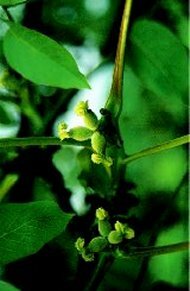 The flowers are small, amphora shaped features which develop on the new season's wood. These vary in colour from the typical olive green on most walnuts, through to pink on the hybrids and the deep mauve on some Asiatic species. The female flowers may be carried singly, in pairs, trebles or even clusters. 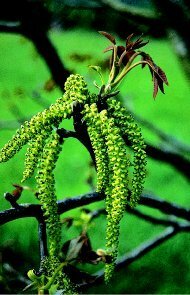 The usual sequence of flowering events is for the male catkins to ripen just prior to the female flowers becoming receptive. If this sequence occurs over too protracted a time, then the catkins have ripened and fallen to earth before the female flower is ready. This is called protandry, and varieties exhibiting this flowering pattern are referred to as "protandrous". If events occur the other way round, which they do less commonly, then the variety is described as "protogenous". If the flowering of the male and female flowers coincide then the variety has the potential to be self-fertile. It should be noted, however that even varieties in which the timing of the flowers appears to be perfectly synchronised, there may still not be complete self-fertility.